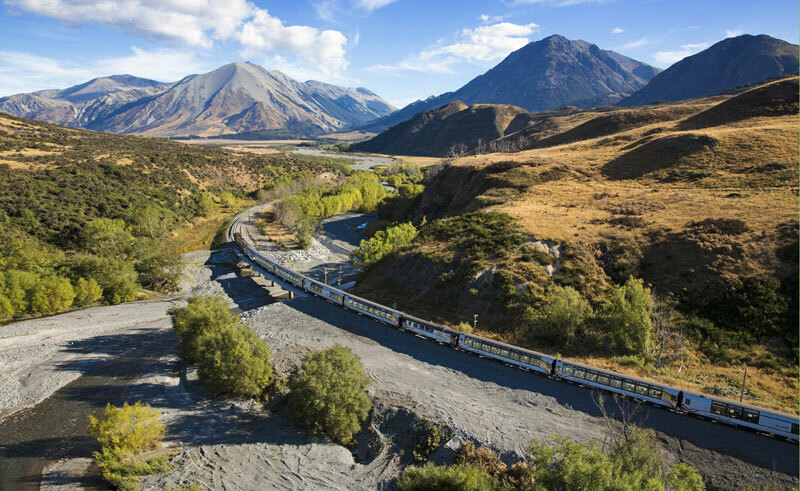 Journey from Christchurch to Arthur’s Pass on one of the world’s best rail journeys – the TranzAlpine. View Arthur’s Park National Park before continuing on to “Glacier Country” via the old jade capital of Hokitika. Marvel at the mighty Fox Glacier before heading south through pristine rainforest over the Haast Pass to Lake Wanaka, The Crown Range, Arrowtown and into Queenstown. Led by experienced local guides, this privat, exclusive overnight tour showcases the best of what the South Island has to offer. Depart Christchurch on the world famous TranzAlpine train and journey across the expanses of the Canterbury Plains as you head towards the Southern Alps. Enter Arthur’s Pass and see the mighty Waimakariri River. Rejoin your guide and experience some of the highlights of the national park before continuing to Hokitika the old jade capital of New Zealand. Travel onwards through farmland and West Coast forests to arrive in Glacier Country. Walk to the viewpoint to see Franz Josef Glacier, before descending to the local village and your accommodation. Take a guided walk on the glacier or a scenic flight overhead to appreciate the sheer size and scale of the glacier before travelling south to reach the mighty Haast River Valley. Stop off and take a short walk on a remote beach or trek to see hidden waterfalls before continuing on to Lake Wanaka. From Wanaka head over the remote and rugged Crown Range and visit the old gold mining town of Arrowtown. Continue on to the adventure capital of the world – Queenstown to complete your tour. Café lunches and afternoon teas are included on this fully guided private 2 day excursion.